The issue of national and European identity is driving many of the issues that are currently of concern to European citizens. The Erasmus+ funded RU EU? project aims to develop an innovative online game, the RU EU? game, that will help students across Europe to develop a better understanding of their own National and European identity and values, as well as those of others, and to challenge them about their attitudes and prejudices by tackling problem solving dilemmas relating to identity. It is hoped that the game will provide an engaging platform for young Europeans to confront some of the complex and confusing issues surrounding National and European identity at a time of change and increasing tension across Europe. 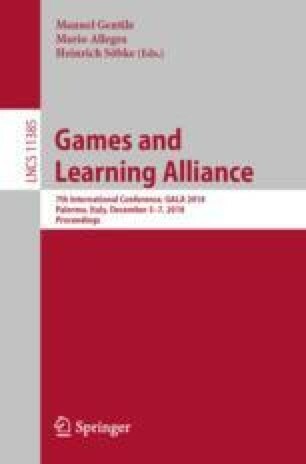 This paper describes the early stages of the game design and focuses on characterizing the learning outcomes and game mechanics for the RU EU? game and bringing these together. The present work was carried out as part of the “RU EU? A game-based approach to exploring 21st century European Identity and Values” project. This project is partially supported by a KA203-Erasmus+ Strategic Partnerships for higher education, grant; KA2, Cooperation for Innovation and the Exchange of Good Practices; Grant Agreement no: Grant Agreement no: 2017-1-UK01-KA203-036601. This presentation does not represent the opinion of the European Community, and the European Community is not responsible for any use that might be made of its content.